in this amazing 66-podcast series! Listen on iTunes or iHeart Radio. Or click each title below. 1 What is the consciousness between lifetimes? Learn how we can re-enter the consciousness between lifetimes, and why our task is to remember what we’ve forgotten: our infinite essence as souls. 2 Did we really choose this life? Learn how we enter as souls, and why we choose what we enter into—even if these situations are challenging or even painful. 3 What are we supposed to do with our natural talents? Learn why we’re here to explore our particular talents, gifts and passions, as fully as we can. And why in some cases, our gift is our presence. 4 Why do some people have easier soul lessons? Learn why it can seem like some people have it easier than others, but from a soul perspective, this isn’t true. Every lifetime is perfect. 5 When is “helping people” not a good idea? Learn why everyone around us is also in school, and our task as souls is to work our own lessons—not try to fix other people. 6 Why do we get stuck and is this a problem? Learn why we are here to learn at the pace we can handle, and why this pace often means we need to take breaks and pauses for integration. 7 Why is failure a good thing? Learn why failure is growing, and why soul growth doesn’t always happen when we’re succeeding—but it always happens whenever we are risking or pushing our edge. 8 How fast can we move through soul lessons? Learn why once you complete a soul lesson, you never need to repeat it. And why we can remember the lessons we’ve completed in past lives. 9 What soul lessons are we here to learn? Learn why every soul has different lessons in a particular lifetime, but all souls will complete the same curriculum eventually. 10 Why is love always the answer? Learn why love is God and God is love and this is the only lesson that matters. And why even if we haven’t learned it yet, we make progress every time we try. 11 What is the purpose of our life? Learn why there are three determiners of our purpose: our gifts, our soul circle, and our location on the planet, and how determining these will help the Universe guide you. 12 How can we create a life of real meaning? Learn why when we live our life from our true purpose we find meaning. This is because we are living the life we came here for. 13 How do dreams bring us Divine guidance? Learn why dreaming takes us other dimensions in the astral realm, where it is very easy to connect with visions and soul knowing. 14 Why does slowing down and “being” matter? Learn why our ability to be present has changed since ancient times, and how doing nothing—no thing—brings us to a state of spacious expansion. 15 What is pure being? Learn why we entered in as pure consciousness, and we will leave this world in a state of consciousness, and our path in the middle, is to return to pure being. 16 What does it mean to be fully engaged? Learn why we can learn to be fully present to every moment in our lives, instead of looping in negative and cultural thoughts–and why this matters. 17 Does the state of “being” mean doing nothing? Learn why “being” does not mean sitting in a cave meditating, but instead means bringing your soul awareness into everything you are busy doing. 18 How does “being” open our awareness, and how long does it take? Learn why awakening is an instantaneous shift from a lower vibrational dimension to a higher vibrational dimension, and how it can happen to anyone. 19 Why is “being” the only thing that will bring us joy? Learn why working toward lower vibrational goals of money, materialism, power and popularity never lead to happiness, because they can’t. 20 What is enlightenment and how can we have it every day? Learn why every day activities can bring you into an ongoing state of enlightenment, and no suffering is required. 21 Why does “numbing out ”create more stress over time? Learn why addictions and distractions eventually become a trap, and why there is another way to feel better. 22 Are distractions worthy of you? Learn why numbing out doesn’t work, and what happens if we look at our addictions and distractions from soul perspective. 23 How does awareness make your life better? Learn what happens when we let ourselves be aware for just one moment, and how that one moment shifts everything. 24 What happens when you enter pure consciousness? Leave why consciousness doesn’t have levels, and why we “enter in,” we get to experience everything all at once. 25 How is bliss our natural state? Learn how we can move from negative thought looping states into a state of bliss, and how we can learn to stay there. 26 How are we meant to enjoy our bodies? Learn why we society teaches us that only certain bodies can be enjoyed, but in reality, every body is meant to be enjoyed. 27 What happens when we feel more? Learn why when we feel bad, it’s often because we don’t let ourselves feel our true feelings. 28 Why can’t we use society’s map for our lives? Learn why the map we’re given at birth by our family and culture can’t ever take us where we’re trying to go. 29 What happens if we waste a lifetime in pain? Learn how when we are wounded and hurt, we take up the role of victim and keep that pain with us for life—but we don’t need to. 30 What happens if we waste a lifetime in the past? Learn why memories can be something to be grateful for, but they are not where we are meant to live—and how letting go of the past can free us. 31 How does failure help us grow? Learn why failure isn’t a bad thing at all, but rather a marker of who we are in a moment of time—and a great revealer of our soul lessons. 32 What does it mean to walk the Mystery? Learn why we are not meant to have a pre-ordained map of what is next, but rather to seek the flow of the Universe. 33 What does it mean to live from your soul? Learn why the soul is the only correct leader of you and your life, and why this makes all the difference in your everyday life. 34 How are spirituality and intuition related? Learn why becoming spiritual makes you intuitive, and becoming intuitive opens your spiritual understanding. 35 Can we connect with the Universe on our own? Learn why there is no middleman required to have direct connection with the Guides or the Angels—with any aspect of the Universe. 36 What does having direct connection mean? Learn why you cannot be separate from God, because you are God yourself—and how this understanding changes you. 37 How we can communicate with the Universe? Learn why it’s common for us to talk to the Universe—but the key is to understand the the Universe answers back. 38 What does vibration tell us? Learn why we think we have to be a in a false state of positivity all the time, but in reality, peacefulness and expansion are more sustaining. 39 What are our psychic windows? Learn why we have the ability to open ourselves psychically and spiritually at any time, and all we have to do is ask. 40 What is the false psychic path? Learn why psychic tricks can lead to fame, power and wealth, but that isn’t the point of them at all. 41 How do psychic visions serve us? Learn why it’s very easy to learn to see guiding visions in our mind’s eye, and this information can help us in our lives. 42 How do psychic messages serve us? Learn why the Universe is very direct at sending us telepathic messages or messages in language, when we are open to them. 43 How do our feelings inform us? Learn why our emotions are not irrational or unreliable, but are clear indicators of our heart’s truth. 44 How do the events that happen in our lives guide us? Learn why the events we experience are not random in any way, but are nudges from a benevolent Universe. 45 How does becoming aware create more awareness? Learn why even a small amount of opening to the Universe is like the key in the lock—the door swings fully open. 46 What does meditation do, anyway? Learn why any kind of meditation—even a simple practice—will help you become instantly more awake and aware. 47 What is the relationship between nature and consciousness? Learn why nature has a unique way of shifting us into greater awareness, and it happens nearly instantaneously. 48 What is the relationship between music and consciousness? Learn why music is a language that we understand not just as sound or vibration, but as emotion—and this creates shifts in us. Learn why intimacy is one of the most powerful ways we can share consciousness with another person. 50 How do peak experiences change us? Learn why having peak experiences shift us dramatically and quickly, because they give us a glimpse of a new reality. 51 What is the benefit of rest and stillness? Learn how when we intentionally choose to drop out of everything and be still, we are able to receive guidance more clearly from the Universe. 52 What does it mean to read anything? Learn why when we let go of distractions and Misbeliefs, we can begin to observe everything with direct knowing, and read it in that way. 53 How is every little thing your answer? Learn why all the signs and synchronicities are important, not just the ones we notice when we are in the midst of psychic gathering. 54 How does intentional releasing help us? Learn why when we release pain and suffering, we are able to live at a much higher level instantly. 55 How does intentional compassion help us? Learn why when we choose compassion as the radical answer, we are shifted instantly and our reality is also shifted. 56 How does intentional gratitude help us? Learn why when we choose gratitude as a go-to response, we are shifted into bliss and joy instantly. 57 How does intentional intuition help us? Learn why when we choose to live from our right-brain intuition instead of left-brain linear thought, our entire reality begins to flow. 58 What is direct knowing and how can we do it? Learn why direct knowing is different than gut feeling or deep knowing, and how you can create this ability now. 59 What does it mean to let the Universe lead? Learn why when you begin to live in Now, you are placed in Flow—and this is how the Universe leads us. 60 What does it mean to live in Flow state? Learn why there is a sweet spot for soul expansion, and how we can learn to live in that energy. 61 How does chaos help us expand? Learn why the opposite of Flow is chaos, and how recognizing this state helps us move back into Flow. 62 Why is pain a marker of stuckness? Learn why whenever we notice pain, it is not a punishment—it is an invitation to reassess what we know at the deepest level. 63 Why is fear a marker of stuckness? Learn why whenever we are afraid to go forward, it is not a sign of a lack of courage—it is an invitation to discover our true feelings. 64 Why is love something we must learn? Learn why love just is—but is also something we can learn to turn to, over and over in our lives. 65 Why is love something we must allow? Learn why love isn’t just something we give, but something we can learn to receive—love from everything. 66 What is the Beloved? Learn why God is the Beloved, but we are also the Beloved—and how this understanding is the key to love without end. 3 ways to study Messages from the Divine! 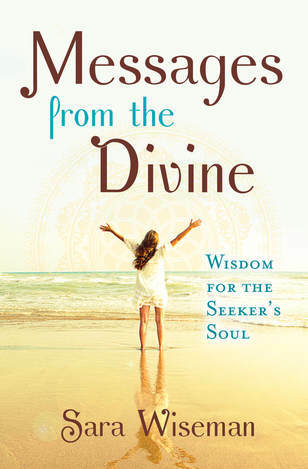 Get Messages from the Divine: Wisdom for the Seekers' Soul! Sign up for the FREE 11-week course. Over 3000 people have participated! Listen to the 66-podcast Messages from the Divine series! ​This is Sara's most innovative work on intuition and spirituality. After 8 years running and over 400 shows, we're on break. Enjoy the archives!